Last fall, while writing up childhood memories of visiting my Grandma Jones' house, I was reminded of an old traditon. En route to their house in St. George, we would often stop at Annie's Drive Inn in Beaver for ice cream (and pinball if we remembered to bring a few quarters along). On one such occasion, I recall sitting in the back of our car and having the double disaster of accidentally spilling most of my chocolate shake all over one my favorite Yankees t-shirts. Ah, the things we remember. Since we visit Kristen's parents in Cedar City every few months, I suggested to Kristen that we stop in Beaver and find Annie's so I could relive this childhood memory. For our first attempt last October, we pulled off the freeway and drove though town, but didn't spot the little drive-in anywhere, so we ended up eating at Dairy Queen instead. After some internet research, I eventually discovered that Annie's had been renamed Mel's. We went down to Cedar City again in early February, so we scheduled another stop in Beaver. Knowing what we were looking for this time, we quickly spotted Mel's on Main Street. As I walked in, the cramped quarters, vinyl upholstered booths, and pinball machine in the corner all instantly registered in my mind. We placed our order, but when I handed my debit card to the cashier, she notified me that they didn't take them—only cash or checks—which we didn't have. It was off to Dairy Queen once again. As we were planning our latest trip down south this past weekend, I once again expressed my desire to eat at Mel's. Kristen half heartedly agreed, ready to just get this trip down memory lane over with already. But armed with the proper location and a wallet full of cash, the third time proved to be the charm. We ordered a pair of "chesseburgers," a large order of fries, and my customary chocolate shake. As we waited, we got to overhear the two teenage workers discuss some juicy local gossip involving someone named Abriana. When our food arrived, the burgers and fries had that perfect old fashioned drive-in taste that I so enjoy. I want to say my shake was just like I remembered, but as Kristen pointed out, I am probably just thinking of the dozens of chocolate shakes I have eaten since then. They didn't have any high chairs, so Eddie got to sit on the bench next to me. Since my food was within the grasp of his curious fingers, eating eventually became an elaborate game of keep away. Once we finished our meal, I pulled out of a pair of quarters so I could enjoy a game of Lord of the Rings pinball. Now this was obviously not their original machine, but part of the tradition nonetheless. I wracked up about 5 million points during my game. While this sounds like a lot, it was still something like 13 million points short of an extra play. Their modest arcade also included an old shooting game called Turkey Hunter, which I almost played just out of morbid curiosity. A few miles down the road, we started laughing at the thought of picking off pixelated turkeys, and I soon found myself wishing I had tried it. There's always next time. Maybe if you go to Beaver again, you can also stop at the cheese factory and get some squeaky cheese. 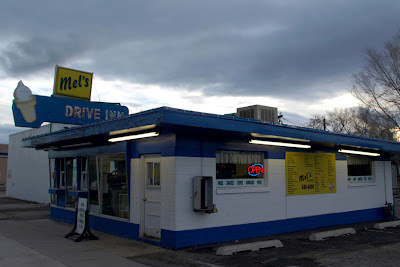 Mel's Drive Inn was actually a Dairy Queen originally.